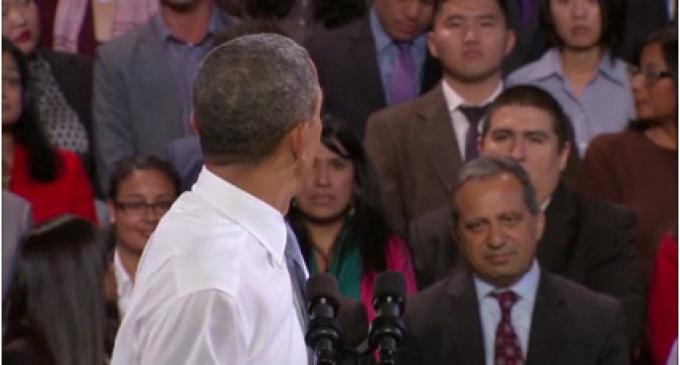 Obama addresses a heckler who was yelling “You have a power to stop deportations for all” by stating that he must obey the laws of the land and work through congress on immigration. I don’t know which is the bigger offense, this guy demanding the president become even more of a tyrant, or Obama stating that he must obey laws after having committed an astounding amount of crimes! After being heckled Monday while delivering a speech on immigration reform in San Francisco, President Obama said he would solve the issue without going through Congress, if only he could. Obama told security to let the young man stay, then responded to the outburst.